Well you can! 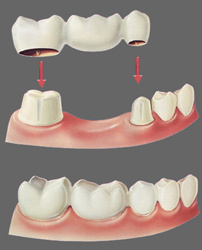 At Ian Barwick, DMD, we may have the perfect solution for you in a fixed dental bridge. Give us a call and we’ll be happy to schedule an appointment for you so the doctor can take a look at that space and recommend treatment options. After examining your mouth and the areas around the missing tooth to determine whether a dental bridge is appropriate for your situation. After subsequent visits, the permanent bridge will be cemented into place. If you practice good oral hygiene and maintain your proper dental cleaning and examination schedule, your new bridge should last for many years, providing you with a winning smile and a gigantic confidence boost!